The Seattle Seahawks lost in a close one to the Jacksonville Jaguars on Sunday, falling to 8-5 on the season. 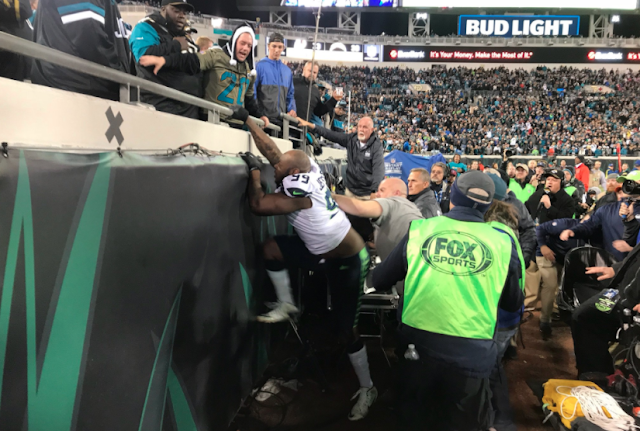 Tensions flared in the end when both teams got into a scuffle while the Jags were kneeling out the clock. Seahawks' Sheldon Richardson bulldozed into a Jags OL during the kneel down, while Michael Bennett rolled into the legs of another lineman. Seahawks defensive lineman Quinton Jefferson was ejected from the game. As he was leaving, he had some stuff thrown at him by some rowdy fans, such as drinks. We were pretty close to having an NFL version of Malice at the Palace happening, but luckily that did not happen. It could have ended up being a lot uglier. Blake Bortles on recent games being chippy. FS Earl Thomas sitting slumping in folding chair in front of his locker in pants, pads lamenting long after #Seahawks loss at Blake Bortles, JAX: "That is a subpar quarterback." Sheldon Richardson, on punch that got him ejected: "A guy grabbed me after the whistle blew. I was protecting myself. Things got a little hot, a little heated." Jaguars CB Jalen Ramsey: "We played like some dogs tonight. We really should have blew them out if I'm being real about it."